On October 30th, Facebook held its third quarter earnings call. Data sets gave insights into how consumers are using the platform that businesses can capitalize on as they think through ongoing Facebook contests, promotions and deals. Additionally, detail was given on revenue stream breakdown and growth on the platform. Of all the users who use Facebook in a given day in the United States, 48% of them, on average, only use Facebook via their mobile device. 20% of the time a consumer spends using apps on his or her mobile device is with a Facebook app. This includes messenger and Instagram. Facebook’s #2 long-term priority is “understanding the world” through the billions of things posted to the Facebook graph each day. With 5 billion people in the world who have not yet discovered Facebook (mainly outside of the United States), international growth remains a top priority for the platform. Post search took over two years to develop, used over 700 terabytes of RAM to organize and is slowly rolling out in the United States. This will allow you to type into graph search, for example, “Posts about Thanksgiving” and view all posts Facebook users have made that are public about Thanksgiving, even if they are not your friends. Facebook’s Instagram gets 150 million monthly active users. Daily active users of Facebook on desktop declined modestly. 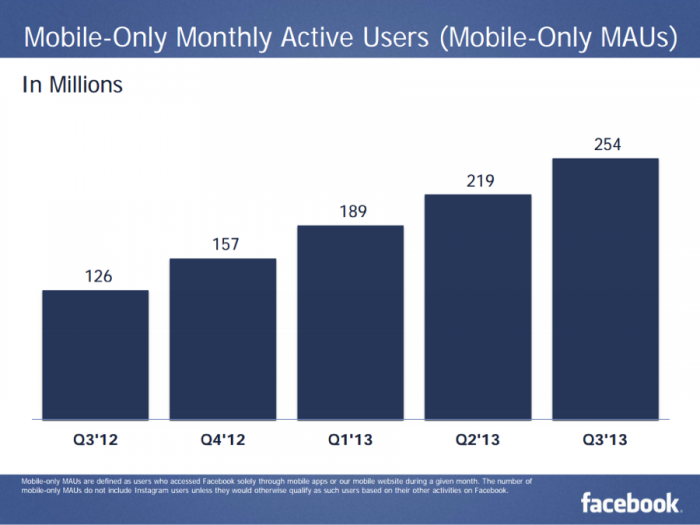 Facebook now has 728 million daily active users driven by growth in mobile. 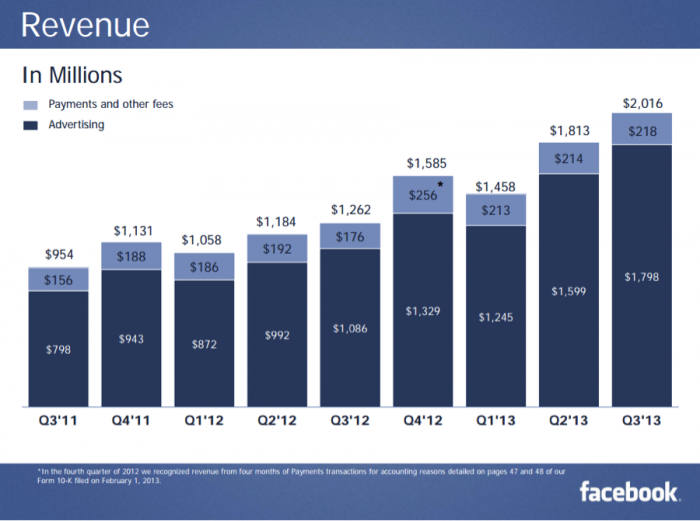 The third quarter was the first quarter that Facebook surpassed $2.0b in revenue. 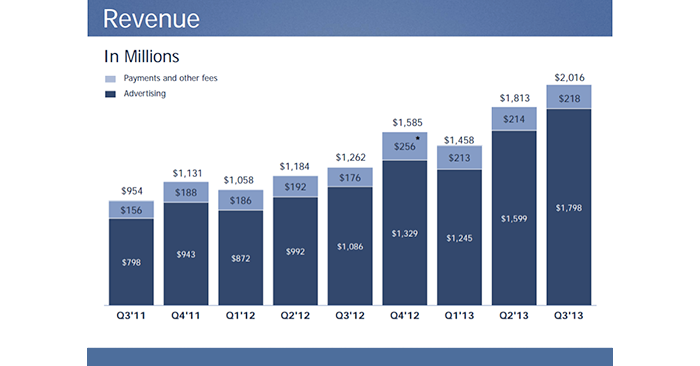 Facebook is driving $1.72 in revenue per user. The daily active user on Facebook engages with one ad per week. Facebook now employs 5,800 people. 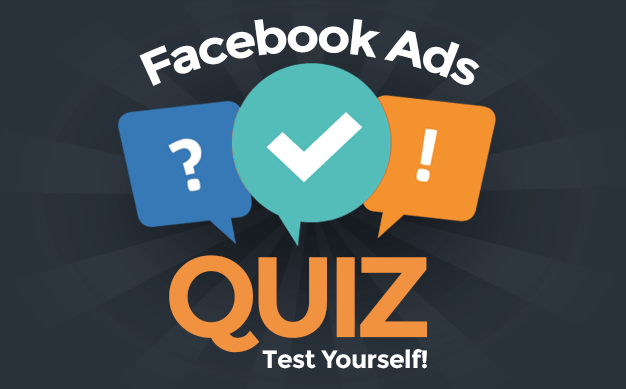 During the quarter, Facebook increased the number of ads shown per mobile user. Facebook usage among US teens remains stable. Facebook’s Artificial Intelligence group is leading the way in the company’s goal to understand the world as they look to make sense of all content people share. Research is currently going into voice recognition. Facebook’s #3 long-term priority is to build the knowledge economy. Facebook continues to build tools that help people use information better so they can do their jobs better. As Facebook builds the knowledge economy, they’ll improve their ad product through better ads, deeper targeting, better analytics and richer formats. Facebook hopes that by understanding the world it will show people ads that feel less intrusive and more relevant to users’ lives. Facebook continues to focus on outcome measurements to help show brands that ad buying on Facebook drives sales. Every Ad Age Global 100 brand has advertised on Facebook over the past year. 62% of new advertisers started with promoted page posts and promote page likes. The total volume of News Feed stories that are ads is about 5%. This number is fairly consistent no matter where the user is located geographically. Graph Search has indexed more than 1 trillion connections. A big focus for Facebook over the next few years ia adding utility to indexed connections. Ad products at Facebook will continue to be developed in a way that lets the ad fit the format of the product they are part of (image ads in Instagram for example). Many of the items in this list highlight the incredible growth Facebook is seeing on mobile devices. Make sure you are crafting your social marketing strategy with this trend in mind. For example, when you promote a contest you’re running on your Facebook page through a link in a status update, make sure the link is a smart URL. This will ensure that anyone who clicks the link, be it on desktop or mobile, see’s the appropriate experience. Another trend in this list is that content is king. Continue creating content on your Facebook page that is relevant to your ideal audience. As Facebook looks to connect the rest of the 5 billion people on earth, the ones likely to buy your product are more likely to find your page if you’ve done a good job catering content to your desired audience. Targeted content will also pay dividends back to your brand as Facebook continues improving Graph Search and Post Search in its effort to build the knowledge economy. Which one of these facts from Facebook’s earnings call surprised you the most? Tell me in the comments below!